I want to start out with a story that is just one of the one million reasons Publix is my grocery store of choice. Today it started pouring while I was doing my shopping. Like torrential downpour. I was standing under the overhang outside of Publix waiting for the rain to subside when one of the Publix employees came up to me and told me that he would stay with my cart while I went to get my car. When I pulled my car up, he proceeded to load all my groceries into the car without me having to get out at all. Top that off by the fact that I saved close to $80 today and it is clear to see why my blood boils when people tell me they shop at Walmart because it's cheaper. Today was a stocking up on basics trip for me. Every single thing I bought was either on sale, had a coupon for it or both. I got tons of stuff for under a dollar! There were a few deals that store I went to was out of so I hope to hit up Publix Sunday to grab the Nivea Shave Gel deal, and to look for a few more Schick Hydro razors too.I just barely spent over $60 before coupons so I could use $5/$30 Winn Dixie coupons. 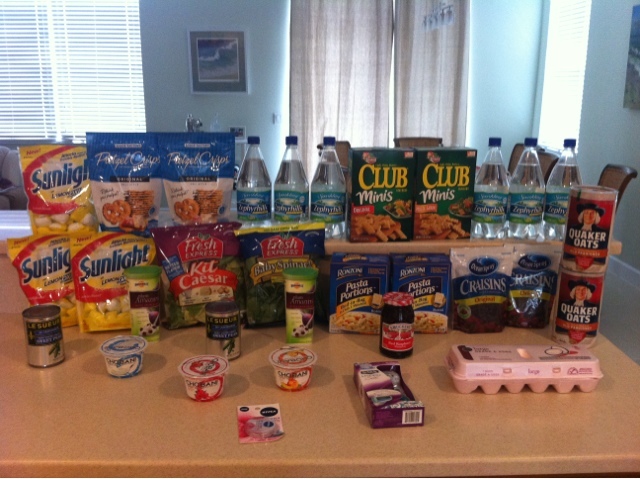 I am waiting for the Fresh Savings event to start in a few days to do my $25 Publix gift card giveaway post so stay tuned for that soon. Check out my post on what's in our deep freezers to see what I have on hand to supplement my weekly shopping trips to make our meals each week. Want to know why you rarely see me buy meat? Check out my post on Zaycon chicken!